ProductsBake’n Joy makes products that satisfy any size or type of bakery business. We use only the highest quality ingredients and source as close to our manufacturing facility as possible. We believe our commitment to using only the best ingredients distinguishes our products in terms of taste and texture. We have products to make your job easier. Founded in 1941, we have grown from donut mix roots to offer a full selection of frozen batters and predeposited ready-to-bake batters. If you want to bake from scratch, we have a huge product selection ranging from donut mixes to muffin, bread, and cake mixes. Our fruit and crème fillings as well as our top quality toppings and coatings are the perfect complement to our perfectly blended mixes and bases. For the baker with a desire for convenience, we offer a full range of bakery products that are ready for the oven. 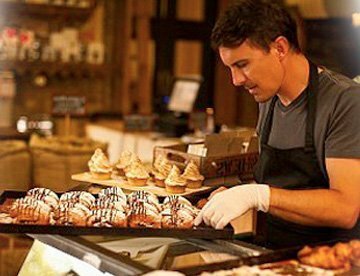 Coffee and donut shops can add frozen, ready-to-bake muffins, cupcakes, and more to create a larger showcase of breakfast and snack items. Our 100% Whole Grain muffins and cookies as well as our vegan products are the perfect addition for shops with a health conscious clientele. Whether you’re looking for frozen ready-to-bake products or a dry mix, we have the optimal solution for you. Whether your concerns are dietary restrictions, cost containment, labor solutions, portion control, or all of the above, our quality line of ready-to-bake frozen batters, top-notch bakery mixes & bases and Boston Coffee Cake® branded products prove to be an ideal solution. Bake'n Joy eNews provides all the goods. Sign up to discover all of our delicious ideas. Food Service Web Design Company ©2019 Bake’n Joy. All rights reserved.